Juicy Couture Eau de Parfum was created once upon a time in a land far, far away called Pacoima, where two nice girls discovered the Juicy Couture world of fashion. They wanted the world to smell like couture so they set out to create the perfect Juicy fragrance. So they put it in a bottle and now every girl can smell like couture. Juicy Couture perfume begins with a rich and full fruity top note of passion fruit that mingles with watermelon, marigold, apple, water hyacinth and crushed leaves, for a headline grabbing effect. This condenses to reveal a fun, flirtatious and elegant heart of wild rose, princess lily and tuberose and a rich, luxurious and pretty base of vanilla creme brulee, precious wood and patchouli. 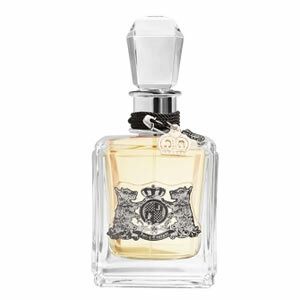 The bottle comes complete with Juicy Couture's world famed J and crown charms, detach the cord and wear them as a neckace!